After eight surgical interventions in eight months, “heart transplant” is working its way into conversations with John’s doctors. John and Barbara are talking about sailing to Ireland instead. This true story, narrated with present-tense immediacy, begins with John flat on his back in a local health club, gasping for air. It ends thirty-one months and four thousand miles later when he, Barbara, and their two youngest children maneuver their sailboat, Grace, into Schull Harbor, Ireland. A gritty account of their family’s struggle to do better than simply survive, it is also a commentary on how love heals, dreams energize, and trauma can be a wake-up call. From hospital ward to the stormy Atlantic, this hard-edge story will resonate with anyone who has struggled with the “heavy weather” that unexpectedly blows through every life. 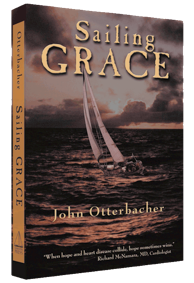 Sailing Grace is available to purchase at this site and in bookstores everywhere. Using PayPal, we accept credit and debit card. Any individual, organization, bookstore, or retail outlet can get information about bulk purchases of Sailing Grace by contacting us at: requests@sailing-grace.com. The real story is the author’s amazing resilience and sheer bloody-mindedness in fighting for his seriously damaged heart… a remarkable book written by a remarkable person. John Otterbacher’s exquisite tale of one man’s journey into himself and of his family’s dramatic crossing of the Atlantic is a powerful elixir for anyone tiptoeing through life and settling for dreams deferred… Sailing Grace is absolutely terrific in its rendering of the sea, of man, and our innate need to engage our soul and senses in ways both small and gargantuan. I wept at the conclusion. Sailing Grace is a thoroughly engaging book. Wise people have known forever that life is a near death experience. The costumes of our lives can be suffocating and Otterbacher and his family shed theirs going to sea… They win big and we win along with them by reading the engrossing and perilous adventure story they made of their lives. When hope and heart disease collide, hope sometimes wins. Funny, tragic, uplifting, moving and humorous. It will speak not only to timid sailors, but also to anyone facing immense difficulties, setbacks and even life threatening danger in their non-sailing lives. An inspirational story with a message for everyone. Heart disease may have run in John Otterbacher’s family, but he was determined not to let that stop him from fully living his life. And that meant testing his limits, whether by running marathons or sailing across the Atlantic four times.